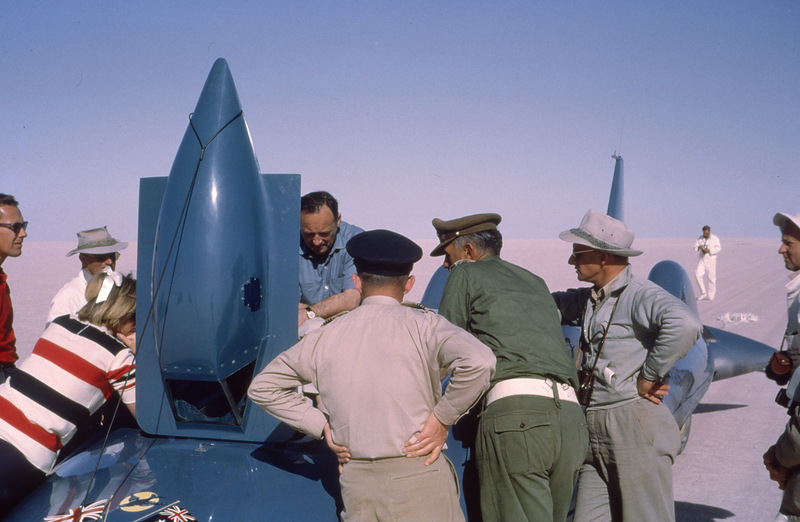 Bluebird CN7 sits poised on her built-in jackass Lake Eyre In South Australia. The year 2014 marks the 50th anniversary of Donald Campbell’s incredible double world speed records set on both land and water. No other person has ever achieved this mammoth feat in the same calendar year, and it is highly unlikely that it will ever be repeated. As a boy living in England, I was aware of Campbell and his achievements, and it was a shock to see the terrible accident on television that claimed his life on January the 4th 1967 on Coniston Water in Cumbria. It was a moment from the 60’s that stayed with me. The following month, in February 1967, my family immigrated to Australia, and little did I realise when we settled in South Australia that this was where Campbell had broken the World Land Speed Record. Some years later, in 1981, two wonderful articles appeared in “Wheels” magazine, which rekindled my interest in Campbell. Written superbly by Evan Green who was Ampol’s Project Manager for the record attempt at Lake Eyre, it gave a remarkable insight into Campbell and the struggles he faced with the record attempt while trying to overcome his own demons. This set me on course to gather a wide range of research material on Campbell that has continued this day. Part of this journey back in 1991 resulted in funding from FilmSouth, to write a two-part TV mini-series about the events at Lake Eyre. Unfortunately, the project fell over several times due to circumstances beyond my control. However, in 1997, I had feature articles published about the record attempts in both Australia and the U.K., while appropriately this July I have an article entitled “The Double” in SALife magazine. Campbell discusses problems with the track to his team. 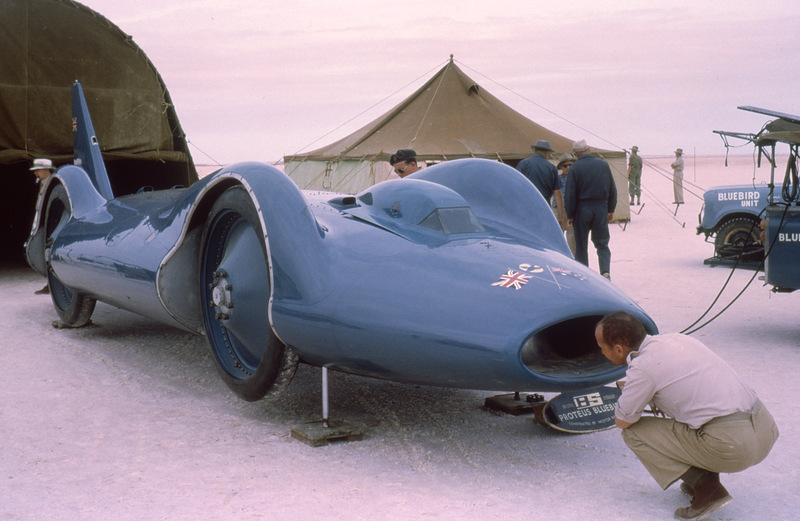 My reason for mentioning all this is that for many years to have an interest in Donald Campbell was akin to being a Bluebird “anorak”, and at times it seemed as though there was a certain amount of apathy towards his achievements. But what is refreshing, in this 50th anniversary year, is that the communities in Australia that were touched by his record attempts are coming together to celebrate them. Thanks to those that were involved in some way with the record attempts and others that witnessed them or have heard anecdotes from friends or family, there has been a groundswell of community support. The people of the Shire of Dumbleyung in Western Australia have been gearing up for a big 50th celebration of Donald’s World Water Speed Record, set on December 31st, and they would welcome any visitors to share in the new years eve celebration. The Dumbleyung Bluebird committee is building a full-size replica of Bluebird K7 and has acquired a former post office building that will become a Bluebird interpretive centre. Donations to their fund are welcome, and they have a terrific web page at www.dumbleyungbluebird.com.au as well as a great Facebook page. 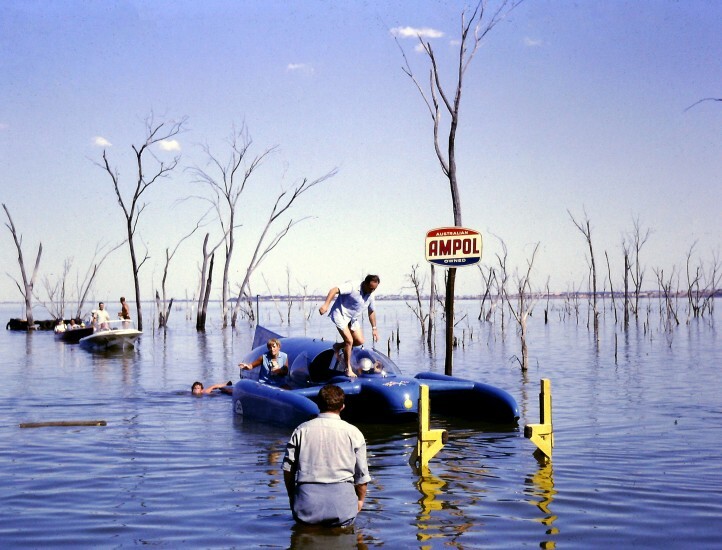 In South Australia, the community of Barmera is also fundraising towards building their own Bluebird K7 replica to be placed on the shore of Lake Bonney where Campbell set an Australian National Water Speed record on November 23rd, 1964, before it proved unsuitable for the world record attempt. The Barmera committee is also working hard towards establishing a Campbell and Bluebird museum as well. Their 50th-anniversary celebrations will take place over the weekend of November 22nd-23rd. They also have a very good web page at www.k7projectbluebird.net and also an excellent facebook page. Perhaps the most pleasing thing that has occurred through these hard-working community committees is a significant number of unseen photographs, movie films and personal recollections that have surfaced on these marvellous websites for everyone to share. And just as importantly they are helping Donald Campbell’s outstanding achievements finally get the kind of recognition that they really do deserve. Words Geoff Dawes © 2014 Photographs John Workman and Jean Pearse © 1964. Video courtesy www.dumbleyungbluebird.com.au and YouTube. This entry was posted in Motoring and tagged 50th anniverasry, Barmera S.A., Bluebird CN7, Bluebird K7, Lake Bonney, Lake Dumbleyung, Shire of Dumbleyung, The Double, World Land Speed record, World Water Speed Record on 12/07/2014 by Geoff Dawes.